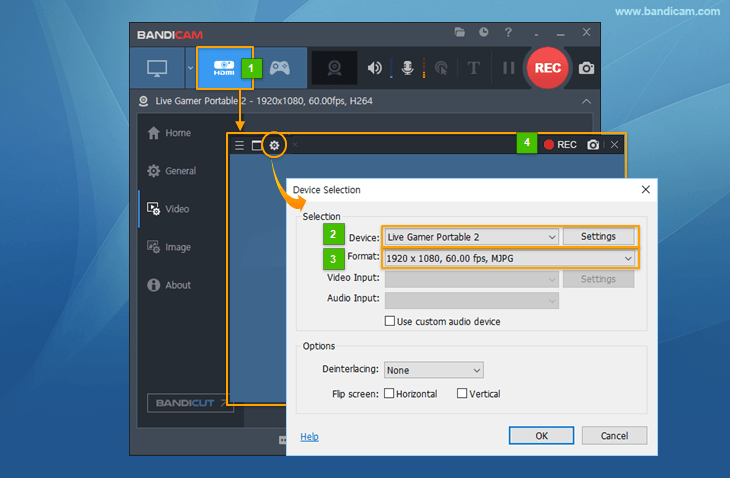 To record external video devices such as a Webcam, Xbox, Smartphone, IPTV, Capture card, etc., start Bandicam and choose the 'Device Recording Mode' by clicking the Webcam/HDMI icon. If you have a webcam or capture device (hardware), you can record USB webcam cameras, video capture cards, and camcorders. 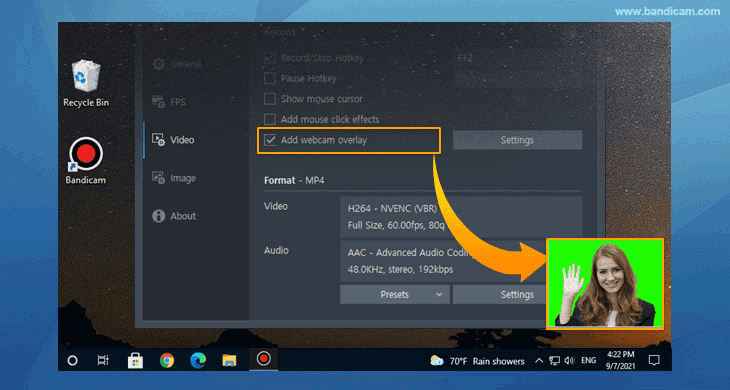 How to capture "webcam video" on PC. How to capture "Xbox, PlayStation" gameplay on PC. How to capture "IPTV, HDTV" screen on PC. How to capture "Smartphone, iPad" screen on PC. 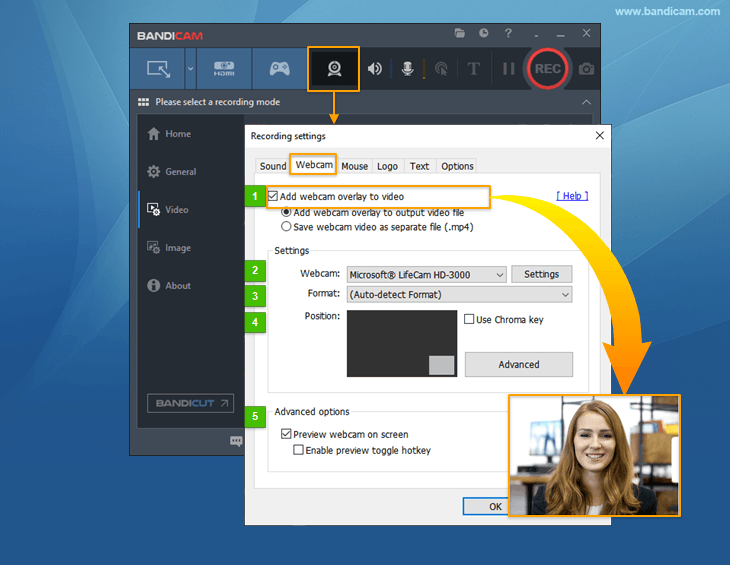 If you use a laptop or desktop PC which has a webcam device, you will be able to see/capture the real-time webcam screen with a high compression ratio and in high quality by using the 'Device Recording' mode of Bandicam. 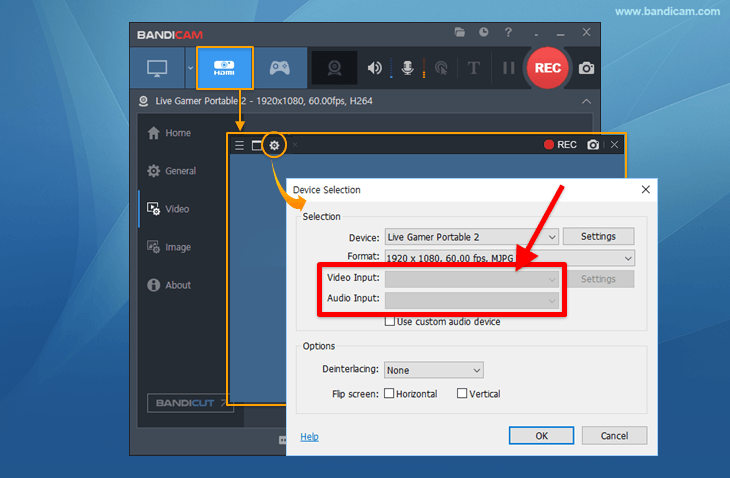 To record your webcam stream simultaneously with the game / screen recording (Picture-in-Picture, Video-in-Video), use the "Add webcam overlay to video" option. If you have a capture device supporting HDMI, you will be able to see/capture the video game consoles (Xbox, PlayStation, etc.) with a high compression ratio and in high quality by using the 'Device Recording' mode of Bandicam. To record your Xbox or PlayStation, you need a capture device which supports HDMI video recording. If you use one of the latest smartphones, you will be able to see/capture the smartphone screen with a high compression ratio and in high quality by using the 'Device Recording' mode of Bandicam. To record your iPhone, iPad or Galaxy S, you need a capture device (hardware) and suitable HDMI cable. You may not be able to record HDCP-encrypted content which uses digital copy protection technology. How to Record iPhone's Screen / iPad's Screen on PC. 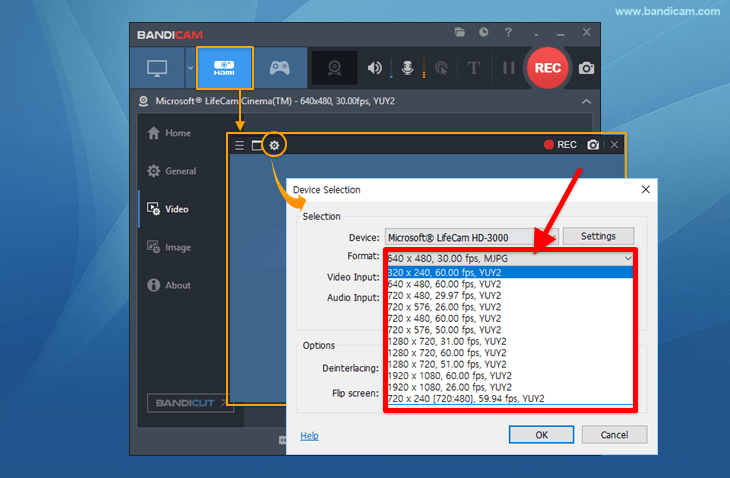 If you have a capture device supporting HDMI, you will be able to see/capture the IPTV, HDTV screen with a high compression ratio and in high quality by using the 'Device Recording' mode of Bandicam. If you use a laptop or desktop PC which has a webcam device, you can record your computer screen and webcam (facecam) at the same time by using the 'Webcam overlay' function. If you can't capture the screen through the 'Device Recording' mode, 1) select another video size at the 'Format' menu , 2) uncheck the Use custom audio device option, 3) disable/uninstall other webcam programs and 4) install a suitable device driver. [Video Input] and [Audio Input] are displayed only if the 'Video or Audio Input' information is found in the device driver. It is common that [Video Input] and [Audio Input] are not displayed for a webcam/capture device. 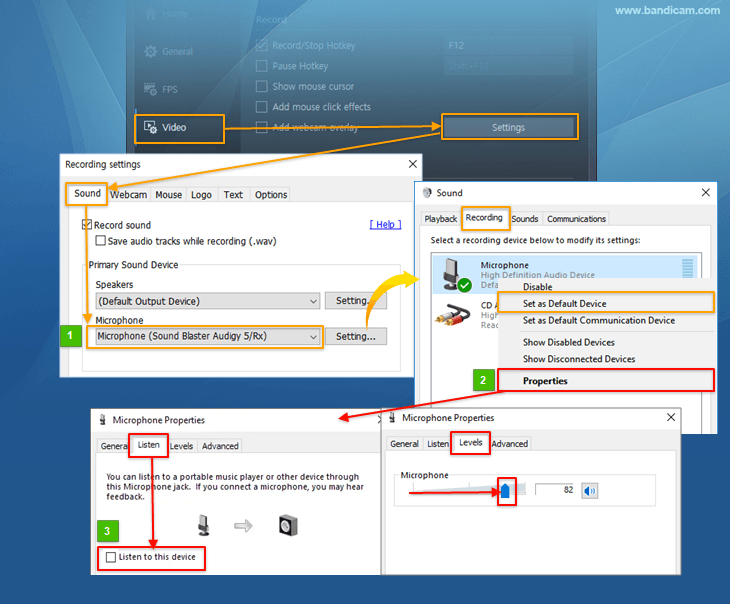 To record the sound of the device, go to the Record settings of Bandicam , and choose the webcam/capture device as the secondary sound device. 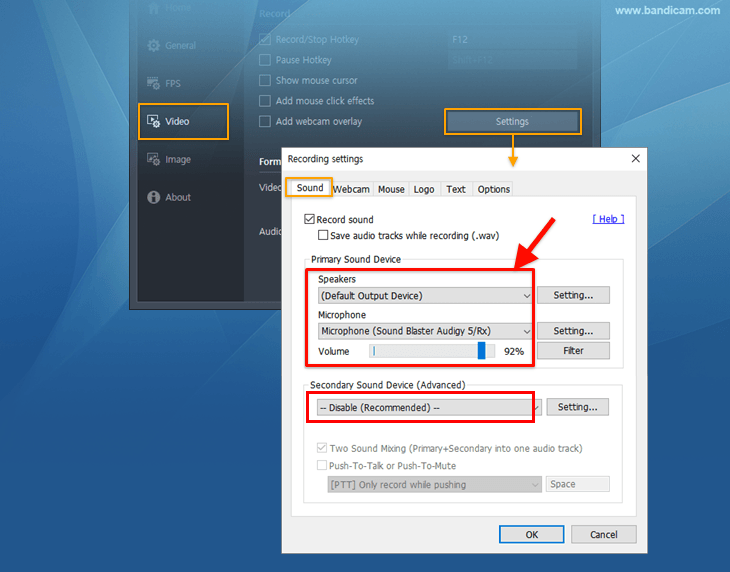 If you still can't record the sound of the device, go to the Sound settings of Windows , and double-click the webcam/capture device under the Recording tab, and then check the Listen to this device option. If you use the Webcam overlay feature, you can add a facecam to one corner of the main video while recording your computer screen or gameplay. (Picture-in-Picture, Video-in-Video).